Outdoor Lighting Perspectives of Nashville wants to know what you and your family have planned in honor of the 4th of July? Independence Day all over America evokes feelings of pride in our country, and a mood of nostalgia and patriotism. Here in the Nashville area, the best place to experience the Fourth of July like it was meant to be celebrated, in my opinion, is at the Whitland Avenue 4th of July Celebration. This celebration is the closest example of Norman Rockwell’s America you are going to get, with an impetus on family, friends and the wonder of the 4th! 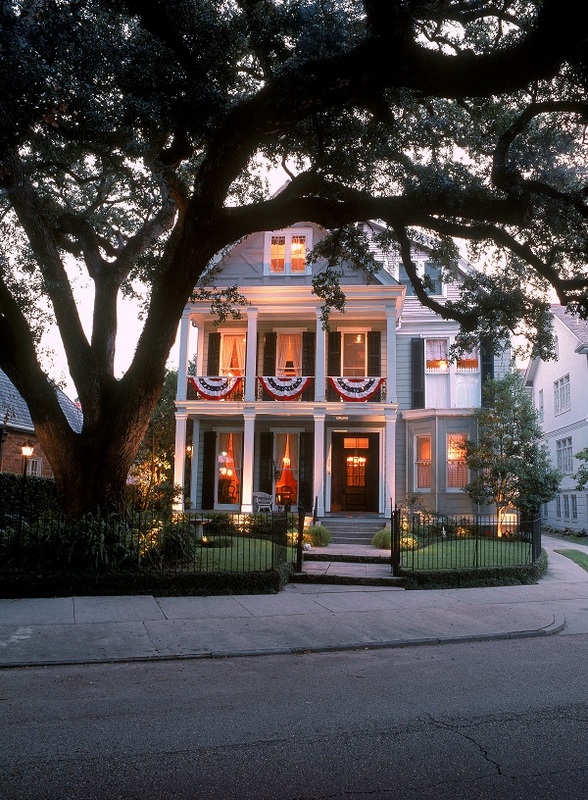 The celebration takes place on Whitland Avenue, a peaceful tree-lined shaded street with beautiful old homes and well-manicured and landscaped yards. Several blocks are blocked off to accommodate the celebration. Almost every house is decorated with American flags and a large American and Tennessee flag hang suspended from wires across the street. This is the 38th year for this event and you live in, or near, Nashville and have never attended, mark your calendars for this year. Please enjoy a peek into the annual reading of the Declaration of Independence, an integral part of the Whitlands 4th of July celebration each year! The event begins at 11:00 am with a parade. This parade is a little different from the traditional holiday parades because it is full of nostalgia of hometown and yesteryear where children decorate their bicycles ablaze with red, white, and blue and proudly display American flags from their handlebars and parade down the street in all smiles! More children are pulled in wagons decked out in patriotic splendor. The children beam with pride as the people on the sidewalk cheer them. Some participants also walk their dogs down the parade route dressed in their holiday canine best. The Children’s Parade kicks off the event, following the parade portion, the celebration continues as live music abounds marking the beginning of patriotic readings, recitations and poetry steeped in Americana. As the band continues to play the picnic begins where you can sample prize-winning homemade desserts and other fair. This entry was posted in Nashville holidays and special events, Nashville outdoor living, Outdoor Lights Nashville and tagged an integral part of the Whitlands 4th of July celebration, annual reading of the Declaration of Independence, Independence Day all over America, July 4th in Nashville TN, Nashville's Whitland neighborhood enjoys life in 'own little bubble', the Tennessean, Whitland Avenue 4th of July Celebration by outdoorlightingnashville. Bookmark the permalink.